a: a sudden, radical, or complete change; b: a fundamental change in political organization; especially: the overthrow or renunciation of one government or ruler and the substitution of another by the governed; c: activity or movement designed to effect fundamental changes in the socioeconomic situation; d: a fundamental change in the way of thinking about or visualizing something: a change of paradigm <the Copernican revolution>; e: a changeover in use or preference especially in technology <the computer revolution> <the foreign car revolution>. Revolution Now! examines, explores, discusses, plans, educates, and seeks to establish the frameworks and social foundations that lie at the heart of every revolution. Without revolutions our world would not be what it is today. There is both Light and Dark, Good and Evil, Right and Wrong in this world, and the same may be said of each and every revolution that has ever taken place. There are no simple or universally correct solutions to modern problems facing the American people and the peoples of the world. It hurts. It really hurts me deep inside, to entitle this article. It means that I have to admit, totally and with some finality, that the American Dream is dead. Now don’t go all sappy or something because I’ve gone and said it. It’s not the end of the world. It’s just the truth. Also, my admission does not mean that I am giving up the fight. I will never do that, nor will I ever give up hope. To the contrary, a free man or woman has a duty to fight to remain free; an unfree man or woman has a duty to fight to become free. Either way, when it comes to truth and freedom, I’ve plenty of fight left in me. Charged by FPSA government with hacking 750,000 classified documents. 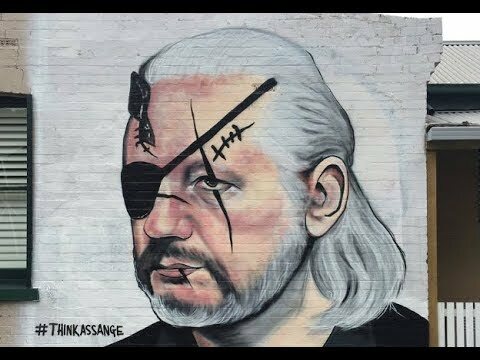 LONDON, England (PNN) - April 12, 2019 - Julian Assange was taken out of the Ecuadorean Embassy after Ecuador betrayed their promise of asylum to the global hero who - through WikiLeaks - has exposed horrible corruption in the Fascist Police States of Amerika and elsewhere around the world. In an extraordinary confrontation, eight terrorist pig thug cops took the WikiLeaks founder out of the embassy in which he has been safely secure from the unlawful and fascist activities of the Fascist United Kingdom and the FPSA. LONDON, England (PNN) - April 11, 2019 - WikiLeaks founder Julian Assange, both the most loved and hated man on the planet, has been arrested by fascist British authorities, and taken from the Ecuadorean embassy, where he has been sequestered for nearly seven years. Now it’s “game on” for the British and Fascist Police States of Amerika governments, the latter of which has opened a not-so-secret grand jury investigation in the FPSA against WikiLeaks. It is highly probable - and what Assange has feared from the very beginning - that Washington will seek to extradite him, and the Fascist United Kingdom will be only to happy to let him go.